Have you ever felt that your right to a parking space has been violated when another driver decides to drive the wrong way down a one-way lane and occupies it before you can get there yourself? If yes, then read on. When it happens to me, I feel like doing this – but I’d have to be driving the right car. Joking aside, this notion of the right to space has led me to ask whether there is just one correct way to interpret this right, or whether the truth is more ambiguous. Fundamentally, this is not just a political or a spatial question but rather one about the possibilities of contradiction and ambiguity: a question of marginality. Questions about the right to space and marginality have a particular importance due to their relationships with identity, mobility, and displacement. This is manifested in the current socio-cultural and geopolitical situations seen in refugee crises, conflict/war zones, and wider issues of immigration, equality and race. The slogan “the right to a space”, is a take on the idea of the right to the city first introduced by French philosopher Henri Lefebvre in the early 1960s. His Writings on Cities have been interpreted by anthropologist and geographer David Harvey in Rebel Cities: From the Right to the City to the Urban Revolution, while Harvey’s work has been critiqued by the geographer Marcelo Lopes de Souza in an attempt to clarify the real meaning behind the expression coined by Lefebvre. De Souza argues that Lefebvre’s idea of the right to the city, which has recently become fashionable, does not only mean the right to a better life on the basis of improved and/or reformed democracy. It also means the existence of new possibilities and new worlds, constantly negotiated, reinvented, and articulated. Strategies such as mutual aid, free association, networks and confederations are seen as tools to overcome class exploitation and oppression with local actions for a global impact. Such possibilities have been more successful in some cases than others. This can be seen in the influence of the Arab Spring (2010) across the Arab world on the Occupy movement in New York (2011), later in London (2012), and then Hong Kong (2014). Soja refers to bell hooks’s work, specifically where she talks about marginality as a space of openness and a chosen site of resistance not imposed by oppressive structures. hooks rejects binary oppositions of race, gender and class. Instead she talks of marginality as multiplicities of other spaces of difference and new sites for the construction of interconnected and inclusive communities of resistance. Fundamentally, this openness of real-and-imagined other spaces of marginality, is what Soja refers to as Thirdspace. In a paper recently published in Cultural Dynamics, I use theories of liminality and Thirdspace to explore the contested urban spaces of Baghdad. 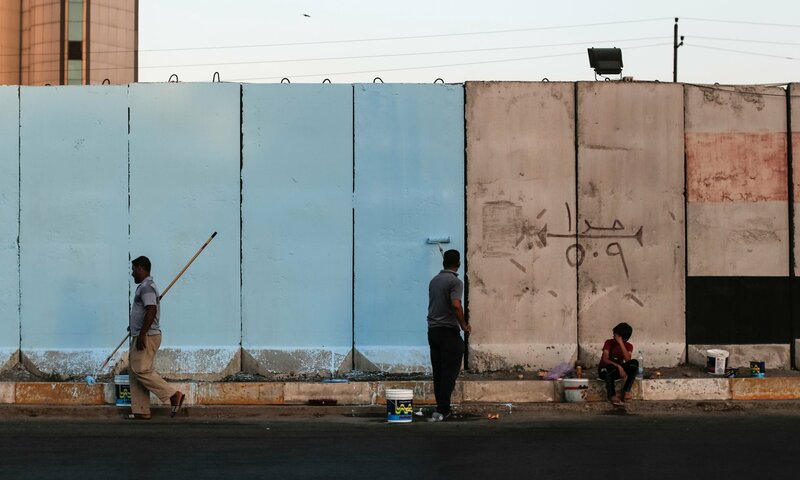 Here, the deployment of “blast walls,” which began immediately after the 2003 invasion of Iraq, continues to disrupt and fragment the spatial and social contexts of the city. 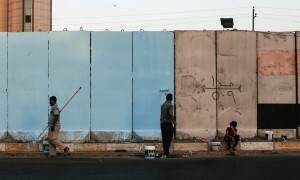 Workers paint blast walls in Baghdad. While not denying the negative aspects of conflict on people and environment, these blast walls have acted as a catalyst for the emergence of new urban structures and as a generator of possibilities for a new way of life. We need to start thinking more deeply about and acknowledging their colossal impact, in many different ways, on the everyday lives of communities and on existing social and power structures. Examining the ambiguity of the right to space can enable us to see complexity, new possibilities, new worlds and new cities, which is of critical importance for those on the margins (by force and not by choice) of society. Something to think about the next time your parking space gets swiped! Dr. Sana Murrani is an experimental architect and theorist in spatial practice. She is a Lecturer in Architecture at Plymouth University. Her principal research interest is in the field of liminal spatial and social practice with a particular focus on the transient conditions of world-making. She is currently a reviewer for Leonardo Reviews: The International Society for the Arts, Sciences, and Technology and Routledge Architecture Thinkers for Architects series.